The avocado is the subject of a recent article by Joel Marion, CISSN (which means he is a Certified Sports Nutritionist from the International Society of Sports Nutrition). Here are some highlights of that excellent article. It’s the only fruit (yes, it’s a fruit, which used to be called “alligator pears”) with an unusually high amount of friendly fat, and it’s virtually sugar free! It’s loaded with dietary fiber, so it’s great for stabilizing blood glucose levels–meaning it’s great for us with diabetes and pre-diabetes. Since fluctuating blood sugar level is the hallmark trait of diabetes, we need to eat foods that help our condition. Avocados is a good stabilizer. Its high fiber content is great for helping to lower risk for heart disease, reduce the bad cholesterol, and raise the good cholesterol. 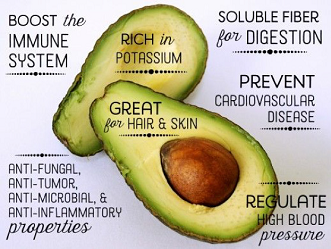 A study published in the Journal of the American Heart Association recommends one avocado per day. It’s loaded with vitamin E, a fat soluble vitamin critical to good hair, skin, and nails, and a powerful antioxidant. Our bodies encounter free radical damage from oxidation on a daily basis, like rust on a car, and Vitamin E combats those free radicals. Avocados can help us look younger. You can even apply avocados as a hair or face mask. It offers a generous dose of potassium (more than a banana) and is very low in sodium, which are both good for lowering blood pressure. Research published in the BMJ Journal in 2009 (Boden, Guenther, et al.) noted that replacing high sodium diet foods such as processed cheese, with a healthy source of fat like avocado, can reduce the risk of stroke. The store doesn’t always have perfectly ripe avocados, so it’s better to buy them a firm rather than soft and let them ripen by putting them in a paper bag for 2-4 days to ripen. Eating them on a dinner salad helps avoid nighttime cravings. Adding Himalayan sea salt, pepper, and even a little hot sauce can bring out the true flavors of the avocado. Finally, eating a third to a half of an avocado with a meal will get your fat-burning engine revved up. Avocados are rich in dietary fats and fiber, so they break down slowly, causing a stream of sustained energy.